Like those subtle changes, your appreciation of the journey (that you’ll be savoring) will also grow because of a couple subtle additions that will help you be better prepared for your journey. Fincantieri floated out Regent’s Seven Seas Explorer today at their Sestri Ponente yard near Genoa. This signifies the end of major construction on the 56,000-ton vessel. Interior finishing now will occupy all of the time until the ship is delivered to the NCLH brand next summer. Water begins to enter the dry dock to float the ship for the first time. 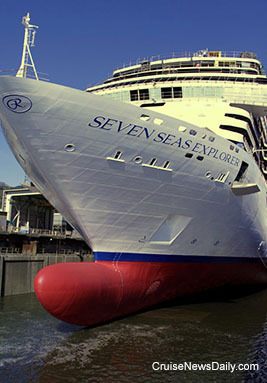 Photo courtesy of Regent Seven Seas. All rights reserved. May not be copied or used without permission. 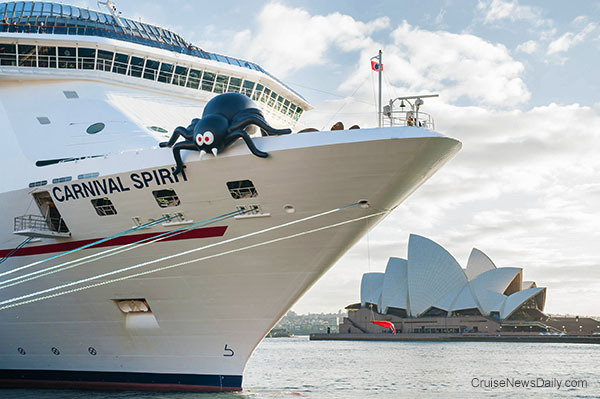 In the "Spirit" of Halloween and all things creepy, Carnival Spirit arrived this morning in Sydney with a giant redback spider on its bow. The native Australian varmint adds an Australian "bite" to the American Halloween tradition. Research shows that more people are afraid of spiders than anything else. This one is more than 18 feet high. If they grow them this big in Australia, we can see why. It would appear that Grand Cayman may finally be on their way to building a pier for megaliners. But before you start looking for Grand Cayman to have reappeared on cruise itineraries, there are still time-consuming steps for the project to go through first. Premier Alden McLaughlin confirmed that on Tuesday the Cabinet approved moving to the next phase of the proposed cruise pier, but he said it could be a couple years yet before construction would start. 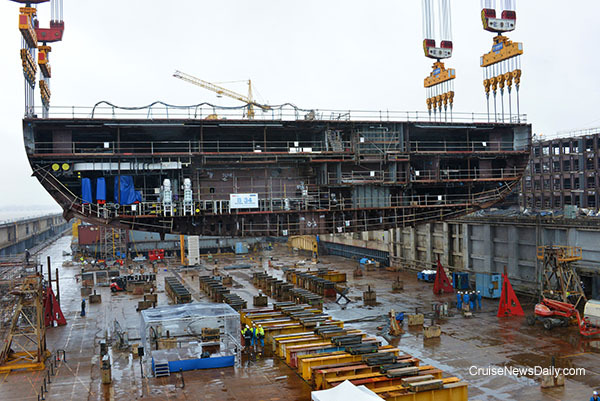 Actual construction began today for Royal Caribbean’s fourth Oasis-class ship when STX France laid the keel at their Sainte-Nazaire yard. The first 1,000-ton block was lowered into place in the giant dry dock by an overhead crane. The block measured 32 feet by 154 feet. 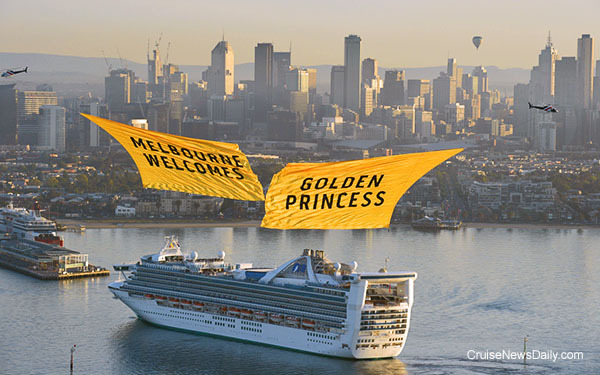 When Golden Princess arrived in Melbourne this morning, she made quite an entrance. As Golden Princess sailed down Port Philip Bay, two helicopters carrying massive golden curtains flew out to meet her. Then in a dramatic move, the curtains were parted to reveal the ship to the city as she made her maiden call at her new home port. Golden Princess arrives at Melbourne for the first time. Carnival Cruise Line revealed today they will take two of their larger ships to China over the next three years to be based there year round. Carnival Miracle will be the first to head China. Carnival said the 88,500-ton Spirit-class ship will reposition in the spring of 2017. The 2004-built ship is the smaller of the two carrying about 2,100 passengers. It was enhanced earlier this year with a number of the Fun Ship 2.0 features. A year later (spring of 2018), Carnival will take an even bigger step into the Chinese market when the 2008-built Carnival Splendor joins her sister there. It is one of Carnival’s larger ships at 113,000 tons carrying 3,000 passengers. Carnival Splendor is a one-off type of ship in the Carnival fleet. It was originally destined for the Costa brand, and built on a Concordia-class hull, but diverted to the Carnival brand about a year before delivery to fill the US brand’s need for capacity. The complete story and perspective appeared in the October 28 edition of Cruise News Daily. If you are sailing aboard Crown Princess (or soon, one of a couple other Princess ships), save a night in your itinerary for a special dinner in Princess’ new upscale gastropub, the Salty Dog. 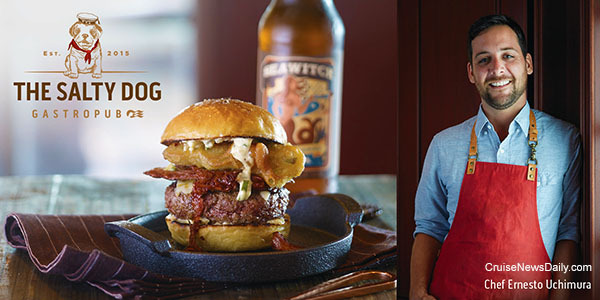 A partnership with Ernesto Uchimura, the former executive chef of Umami Burger and current chef of Plan Check Kitchen + Bar in Los Angeles, pairs gourmet small plates he has created with craft beers (and other beverages) and is now being served nightly in the Wheelhouse Bar aboard Crown Princess. Details appeared in the October 28 edition of Cruise News Daily. In case it wasn’t marked on your calendar, last Sunday was World Pasta Day. One place it didn’t slip by unnoticed was aboard Costa’s entire fleet of 12 ships. The event was celebrated on Costa ships no matter where they were around the globe, including Costa Luminosa which is on an Around the World cruise. Making the excitement even more keen was that Costa is in a partnership with Barilla Pasta. The complete story appeared in the October 27 edition of Cruise News Daily. Westerdam opened Port New Orleans' winter season of port calls yesterday. The city will have 19 port calls by seven ships through this fall and next year. Details appeared in the October 27 edition of Cruise News Daily. Even though it won’t be delivered for more than a year, P&O Australia is already planning the changes they will make to Dawn Princess when she becomes part of the P&O Australia fleet in early 2017, right down to the last detail. Like new parents, they’ve even chosen a name. The 77,000-ton ship will be renamed Pacific Explorer, and the first season it will be based at Sydney, beginning in May 2017. Itineraries will be released next month. The complete story appeared in the October 26 edition of Cruise News Daily. Splendour of the Seas was inspected by authorities in Venice after its engine room fire and found to be safe to sail. A 50-year-old Honduran cleaner was arrested aboard Costa Diadema and charged with a sexually assaulting a 15-year-old French girl aboard the ship. HRH Princess Anne will attend New York's Trafalgar luncheon aboard Cunard's Queen Mary 2 this Thursday. Details appeared in the October 26 edition of Cruise News Daily.